Need a new gaming monitor? You’ve come to the right place. Here, you’ll find only the best gaming monitor deals as well as everything you need to look out for when buying a new display. We’ll make sure that you pick just the right panel type, refresh rate, resolution, and other specs according to your gaming preferences and available budget. Whether you just need a good but cheap gaming monitor under 100 USD or the absolute best gaming monitor there is, you’ll find them both here as well as everything in-between. As long as you stick to our tips and guidelines, we guarantee that you’ll be satisfied with your pick for the money paid. So, make sure you decide on what’s the ideal panel type, screen size, resolution, and refresh rate for you as well as if there are any specific features such as HDR (High Dynamic Range) and VRR (a variable refresh rate technology provided by FreeSync and G-SYNC) that you want on your new display. Note that you can now use VRR on FreeSync monitors with NVIDIA cards (GTX 10-series, RTX 20-series, or newer – requires at least 417.71 drivers). G-SYNC compatible monitors are officially certified by NVIDIA and will work without issues. However, some FreeSync monitors that are not certified will work just fine as well (we’ve marked them as ‘Stable’) while the others will not function properly (labeled as ‘Unstable’). 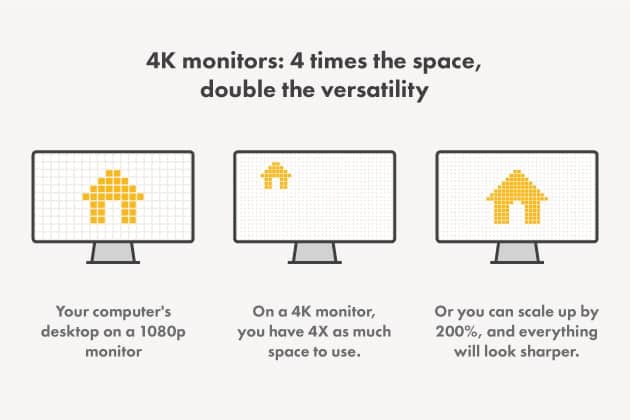 Moreover, ensure that your PC system/console will be able to adequately drive the select resolution at the desired frame rate and that it’s fully compatible with your new monitor in terms of connectivity (appropriate ports, cables, etc). While we have included console gaming monitors in this guide, you may want to visit our dedicated guides for consoles including best monitors for Xbox One/PS4, best monitors for Xbox One X/PS4 Pro, and best TVs for console gaming. Got a limited budget? Don’t worry, you will be pleasantly surprised by the picture quality and performance the following monitors offer at such affordable prices. 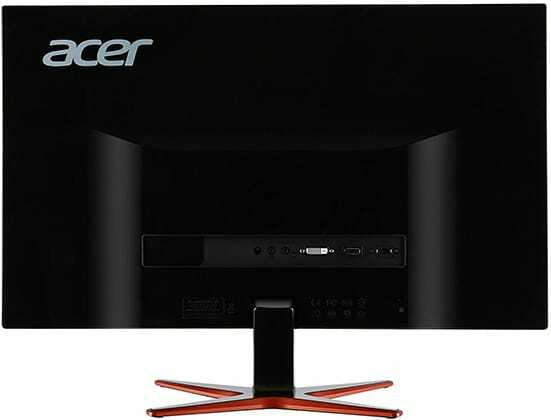 The Acer SB220Q offers specs you aren’t going to find in any other gaming monitor under $100. You get 1080p, IPS, and FreeSync up to 75Hz which guarantees a smooth performance and a stunning picture quality. The IPS panel of the Acer SB220Q monitor ensures accurate, consistent, and vibrant colors as well as wide 178-degree viewing angles. Similarly priced (some even more expensive) TN panel alternatives offer washed out colors in comparison as well as narrow 160°/170° viewing angles that cause the image to shift in color, contrast, and brightness when the screen is looked at skewed angles. While the Acer SB220Q is only 21.5″ in size, it also means you get a high pixel-per-inch ratio of 102 PPI (pixels per inch) thanks to its 1920×1080 Full HD resolution. This results in sharp and vivid details as well as plenty of screen real estate. Further, the monitor supports AMD FreeSync over HDMI which provides you with a variable refresh rate for compatible AMD graphics cards (including Xbox One/S/X consoles). A variable refresh rate means that the monitor can change its refresh rate in sync with the GPU’s frame rates which eliminates screen tearing and stuttering. 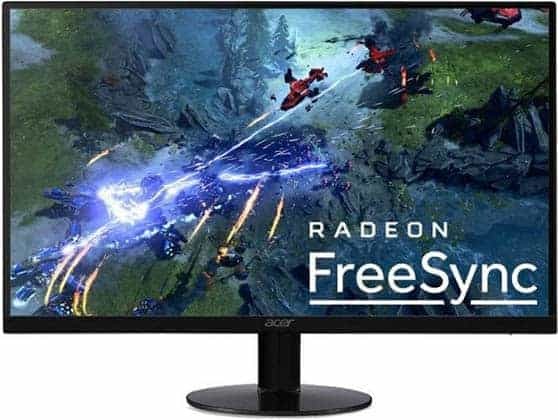 The Acer SB220Q FreeSync range amounts to 48-75Hz/FPS, so once your FPS (Frames Per Second) rate dips below 48, FreeSync stops working until your frame rate recovers. Other useful gaming-related features include customizable crosshairs and Black Boost for better visibility of objects in dark areas in video games. The Acer SB220Q also features a slim design with very thin bezels which makes it a great choice for a multi-monitor gaming setup. Unfortunately, its stand is tilt-only and it lacks VESA mount compatibility. Connectivity options include HDMI 1.4, VGA, and a headphones jack. Overall, the Acer SB220Q is hands-down the best gaming monitor you can get under $100. You may want to consider investing ~$50 more for the next display though. The LG 24MP59G-P is very similar to the Acer SB220Q. Besides getting a bigger screen, you also get more useful features for gaming. The LG 24MP59G is based on a 1080p IPS panel as well, so you can expect the same picture quality. Since it has a bigger screen though, it has a bit lower pixel-per-inch ratio of ~92 PPI. Additionally, it supports AMD FreeSync with a wider variable refresh rate range of 40-75Hz. What’s more, while the LG 24MP59G is not on the official list of G-SYNC compatible monitors, it works just fine with compatible NVIDIA cards! So, if you have a budget setup with a GTX 1050/Ti or an entry-level AMD card, and want an affordable monitor, the LG 24MP59G is simply perfect for you. Furthermore, there are plenty of gaming features including custom crosshairs, Black Stabilizer, pre-calibrated gaming picture presets (two FPS and one RTS), Dynamic Action Sync which minimalizes input lag, and 1ms Motion Blur Reduction which via backlight strobing further eliminates ghosting in fast-paced games. 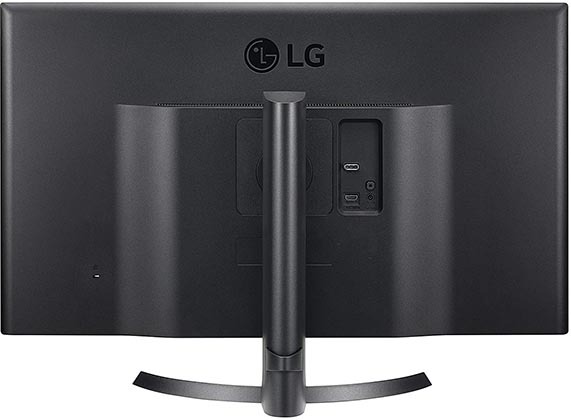 Just like the SB220Q budget monitor, the LG 24MP59G is not VESA mount compatible and it has a tilt-only design. At the back of the monitor, you will find HDMI 1.4, DisplayPort 1.2, VGA, and a headphones jack. FreeSync works over both DP and HDMI with a 40-75Hz range. In case you mostly play undemanding and competitive games, and if your FPS rate is usually over 75FPS, we recommend investing another $50 in the next 144Hz display. If you care more about visuals and better graphics and mostly play newer games where you hardly surpass 75FPS, the LG 24MP59G is a better pick for you. On Amazon, you will also find the 27″ model of this monitor, the LG 27MP59G, though we recommend the 24″ version as it has a higher pixel density and therefore a sharper image quality. In this category, you will find the best 1080p gaming monitors with refresh rates ranging from 144Hz to 240Hz. You will also find what are the alternatives and how they compare to our picks. The Acer XFA240 is the best gaming monitor under 200 USD when it comes to competitive gaming. In comparison to the LG 24MP59, the Acer XFA240 offers a higher refresh rate and a faster response time at the cost of color quality and viewing angles. So, if you’re mainly a competitive gamer, a 144Hz gaming monitor is the way to go, and the Acer XFA240 offers the best value for the price. While TN panels have inferior colors and viewing angles, they offer the best response time speed of only 1ms which entirely eliminates ghosting and motion blur in fast-paced games. The Acer XFA240 supports both AMD FreeSync and NVIDIA G-SYNC with compatible graphics cards with a variable refresh rate range of 48-144Hz over DP and 48-120Hz over FreeSync HDMI. Available gaming features include Black Level and customizable crosshair overlays. In addition, there are three Game modes where you can edit/save your settings. The only thing this gaming monitor is missing is a motion blur reduction technology though some users prefer not to use this feature anyway. 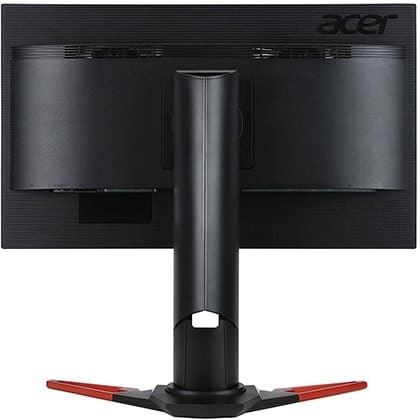 The design of the Acer XFA240 includes fully ergonomic adjustability with up to 150mm height adjustment, -/+ 60° swivel, -5°/35° tilt, 90° pivot, and VESA mount compatibility. Display connectors include DisplayPort 1.2, HDMI 1.4, and Dual-Link DVI-D. You will also find two 2W integrated speakers and a headphones jack. 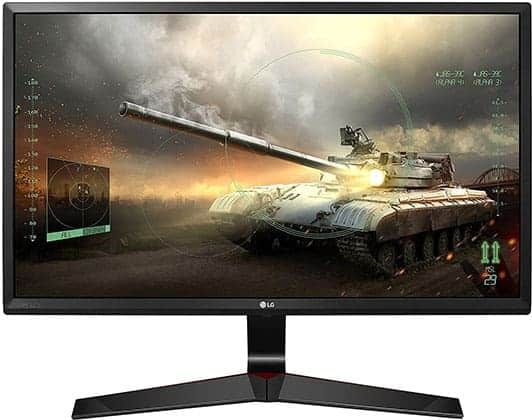 LG 24GL600F – 1080p 144Hz 1ms gaming monitor with motion blur reduction, FreeSync, and stable G-SYNC performance. AOC G2590FX – 24.5″ 1080p 144Hz 1ms gaming monitor with a slightly brighter image quality but a lower pixel density. Also G-SYNC compatible, but more expensive as well. 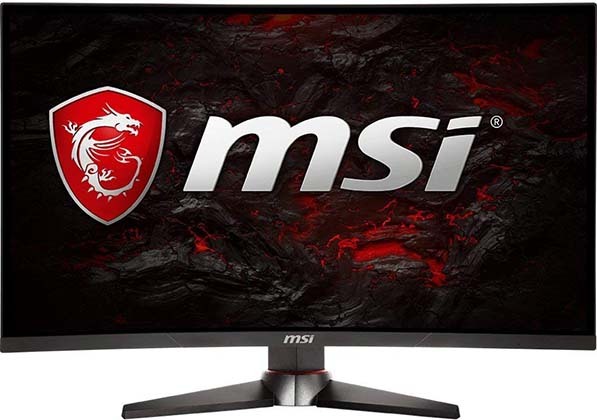 MSI MAG241C – 24″ 1080p 144Hz FreeSync curved gaming monitor with a VA panel and motion blur reduction. Offers better image quality, but has more ghosting in fast-paced games. G-SYNC support is stable. Overall, we recommend the Acer XFA240 as the best 144Hz monitor for the money. 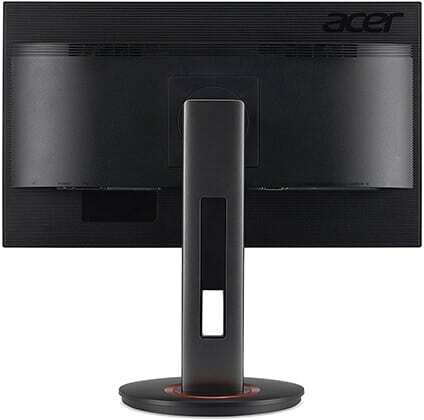 Note that there’s also a similar model dubbed as the Acer XF240H which is not officially G-SYNC compatible. Now, not everyone is willing to sacrifice image quality for performance, but those who are will certainly find the ASUS VG278Q 144Hz gaming monitor alluring. The ASUS VG278Q is fairly similar to the Acer XFA240 except that it’s 27″ in size. This also means that due to its 1080p resolution, it has a lower pixel density of 81 PPI. At this point, there’s notably less screen space available and the image becomes somewhat pixelated. In video games, this isn’t as bothersome as you can apply some anti-aliasing effects and remove jagged edges (also called the staircase effect) caused by low resolution/pixel density. However, if you use your monitor for work or type and read a lot, we don’t recommend this monitor for you. You should either pick a smaller 24″ 1080p monitor or a higher resolution display. Just like the XFA240, the VG278Q supports FreeSync and it’s G-SYNC compatible. 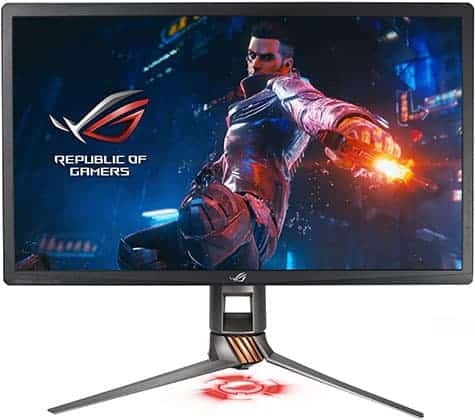 Plus, it offers a motion blur reduction technology called the ASUS Extreme Low Motion Blur (ELMB) which allows for backlight strobing at 120Hz and 144Hz. Other gaming features include customizable crosshairs, on-screen timers, an FPS counter, and pre-calibrated picture presets for different gaming genres (FPS, RTS/RPG, Racing, and MOBA). The stand of the monitor allows you to lift the screen up to 130mm, tilt it by -5­°/33°, swivel by 90°, and rotate by 90°. 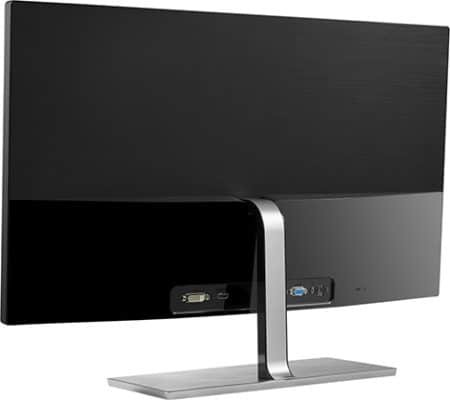 The ASUS VG278Q is also VESA mount compatible while its connectivity options consist of DisplayPort 1.2, HDMI 1.4, Dual-Link DVI-D, a headphones jack, and two 2W speakers. ASUS VG279Q – Same as the ASUS VG278Q but has an IPS panel instead. It offers better colors and viewing angles, but not as fast response time performance. We recommend it if you want a good balance between image quality and performance. Stable G-SYNC performance. 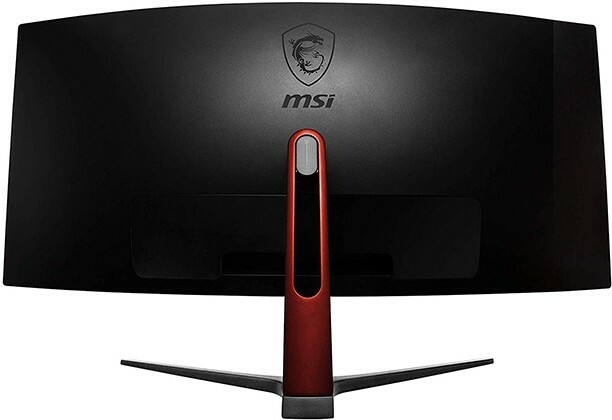 MSI MAG271C – The 27″ version of the MSI MAG241C with a curved VA panel display. G-SYNC support is stable. 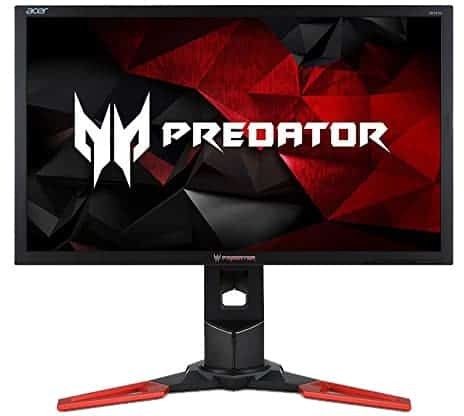 The Acer Predator XB241H is the cheapest G-SYNC gaming monitor which will certainly raise interest in those with powerful NVIDIA graphics cards. It’s a 24″ 1080p 144Hz 1ms gaming monitor that overclocks to 180Hz, and in addition to G-SYNC, you get NVIDIA’s ULMB (Ultra Low Motion Blur) backlight strobing technology. Unlike G-SYNC compatible monitors that support a variable refresh rate over the Adaptive-Sync standard, G-SYNC monitors feature a special integrated module by NVIDIA. This module ensures a wide dynamic refresh rate range, lower input lag, and variable overdrive which allows for simultaneous use of response time overdrive and variable refresh rate for minimal ghosting with G-SYNC enabled. However, this also increases the monitor’s price. In comparison to the Acer XFA240 model, you’re getting a slightly better picture quality, though it’s still a far cry from IPS and VA variants when it comes to color quality and contrast. In addition to G-SYNC which has a VRR range of 30-180Hz/FPS, you get the option to enable ULMB backlight strobing at either 85Hz, 100Hz, or 120Hz for CRT-like motion clarity. Other gaming features include on-screen crosshairs, Dark Boost, and three customizable picture preset modes. The design of the monitor is robust and versatile with up to 150mm of height adjustment, +/- 30° swivel, 90° pivot, -5­°/35° tilt, and 100 x 100mm VESA mount compatibility. Connectivity options include DisplayPort 1.2, HDMI 1.4 (max 60Hz), two 2W speakers, and a headphones jack. Thanks to its G-SYNC module, the Acer XB241H offers a superior input lag and pixel transition performance while its 180Hz refresh rate provides a notable improvement over 144Hz. However, for the same amount of money, you could get a G-SYNC compatible 1440p 144Hz or a 1080p 240Hz gaming monitor instead. Of course, these two displays also require a more powerful PC rig. Unlike the 24.5″ 240Hz models, the 23.8″ ASUS XG248Q was built for 240Hz gaming from the ground up. It offers all the features you may find on other 240Hz models including both FreeSync and G-SYNC support as well as motion blur reduction (up to 240Hz!) for a great price. As far as the image quality is concerned, there’s no upgrade in comparison to the previous TN models. However, you get the rapid 240Hz refresh rate which may not offer as a noticeable jump as going from 60Hz to 144Hz, but the difference is definitely there. Moreover, while most 240Hz monitors with backlight strobing can only strobe up to 144Hz, the ASUS XG248Q 24-inch gaming monitor can strobe at 120Hz, 144Hz, 200Hz, and 240Hz! You will also find 6 overdrive presets, gaming picture profiles, custom crosshairs and timers as well as the AuraSync customizable RGB lighting technology. 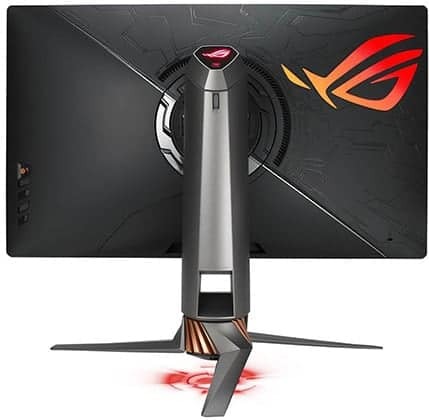 The ASUS XG248Q best 240Hz monitor offers full ergonomic support and extensive connectivity options including two HDMI 2.0 port, DisplayPort 1.2, a dual-USB 3.0 hub, and a headphones jack. ViewSonic XG2530 – The cheapest 240Hz gaming monitor with FreeSync support but no motion blur reduction. BenQ ZOWIE XL2546 – A high-end 240Hz gaming monitor with the advanced Dynamic Accuracy backlight strobing technology with lower brightness penalty. It’s also a lot more expensive. ASUS XG258Q – The more expensive 24.5″ version of this monitor which is actually an older model. It has a slightly bigger screen but no USB ports and its backlight strobing capability maxes out at 144Hz. 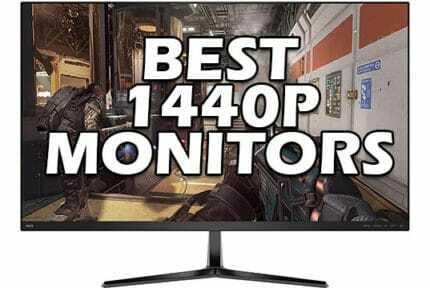 Looking for a 1440p gaming monitor? Apart from the AOC Q3279VWFD8, there aren’t any other as good and cost-effective low refresh rate 1440p gaming displays. There are plenty of great 1440p 144Hz+ models available though! 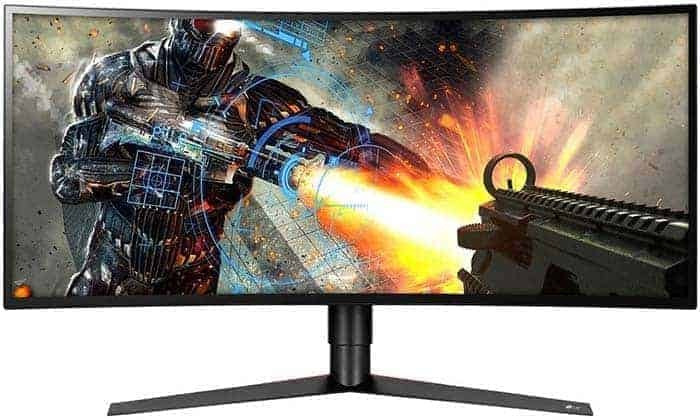 If you’re not interested in a high refresh rate displays and would rather have a bigger monitor with a higher resolution and better panel, the AOC Q3279VWFD8 is undoubtedly the best gaming monitor under 250 USD. While there are 27″ 1440p 60Hz monitors available, these are more intended for everyday/office use. Moreover, they are actually more expensive, limited to 60Hz, and have no variable refresh rate technology. Although we find 27″ to be the best monitor size for 1440p, the 32″ AOC Q3279VWFD8 is not bad either. You get the same pixel density i.e. screen real estate and detail clarity, as you would on a 24″ 1080p monitor, but a lot bigger screen. The monitor features an IPS panel with 10-bit color depth (8-bit + FRC) which ensures outstanding color accuracy, consistency, and vibrancy. Besides AMD FreeSync up to 75Hz, useful gaming features include AOC Shadow Control, Game Control, picture presets (FPS, RTS, Racing, and three Custom), and four response time overdrive presets. The monitor is not officially G-SYNC compatible, but it works with compatible NVIDIA cards though there are certain issues. For instance, the AOC Q3279VWFD8 will desynchronize with the GPU after a while and require a restart. It will work until the issue occurs again. Regardless, if you have ab AND card, the monitor works flawlessly with FreeSync (48-75Hz range over both HDMI and DP) – even without VRR, it’s a great display for the price. The AOC Q3279VWFD8 has a tilt-only design and no VESA mount compatibility which is a shame. Connectivity options include DisplayPort 1.2, HDMI 1.4, VGA, DVI, and a headphones jack. 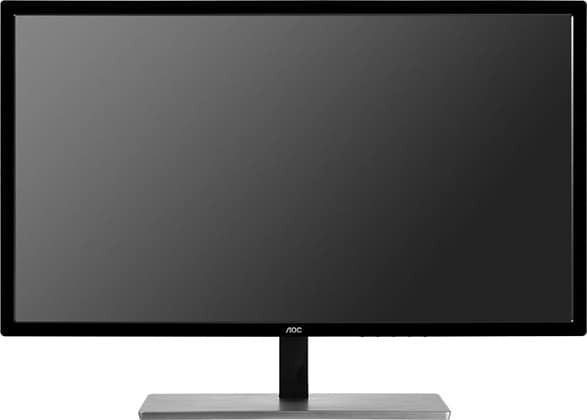 AOC Q3279VWF – The same monitor but with a VA panel instead of IPS. It has a higher contrast ratio but slower response time. It also has a glossy screen surface. We recommend the VA model for movies and the IPS version for fast-paced gaming. The Acer XG270HU is the most affordable gaming monitor that offers both 144Hz and 1440p. Plus, it supports FreeSync and it’s officially G-SYNC compatible. 1440p (2560×1440 Quad HD) on a 27″ monitor provides you with the perfect pixel-per-inch ratio. You get maximum screen space and detail clarity without any scaling necessary. However, you also have to keep in mind that it’s a lot more demanding than 1080p, especially at higher frame rates. So, make sure your CPU/GPU can handle it. Having said that, the Acer XG270HU has a TN panel so while the picture is extra sharp and clear, the colors are still pale in comparison to IPS and VA panels. Thanks to its 1ms response time speed though, there’s no ghosting, trailing, or motion blur in fast-paced games which is what this monitor is built for. 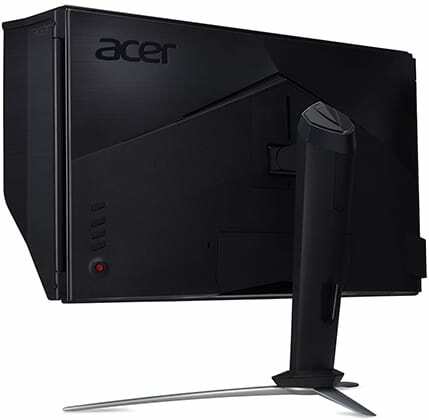 Unlike most gaming monitors in this guide, the Acer XG270HU has no exclusive gaming features such as custom crosshairs, picture modes, blur reduction, etc – since it is an older model. On a brighter note, it supports both FreeSync and G-SYNC without any issues; the VRR range is 40-144Hz. You will also find three overdrive modes in the OSD (On-Screen Display) menu. Unfortunately, the monitor lacks VESA mount compatibility and it’s tilt-only. Connectivity options include DVI, HDMI 2.0, DisplayPort 1.2, a headphones jack, and two 2W integrated speakers. Dell S2719DGF – A 27″ 1440p 144Hz 1ms gaming monitor that overclocks to 155Hz. It supports FreeSync, and while it’s not officially G-SYNC compatible, there aren’t any issues when running VRR with NVIDIA cards. It also has custom picture presets, the Dark Stabilizer feature, a fully ergonomic design, and more connectivity options – but it’s more expensive than the XG270HU. AOC AG241QX – A 24″ 1440p 144Hz 1ms gaming monitor. It’s officially G-SYNC compatible and a great more affordable alternative, especially if you sit a bit closer to your screen and would prefer a smaller monitor. It also has more connectivity options and a versatile design. The MSI Optix MAG27CQ is also a 27″ 1440p 144Hz gaming monitor but it has a curved screen and a VA panel for a more immersive gaming experience but a weaker performance when it comes to competitive gaming. 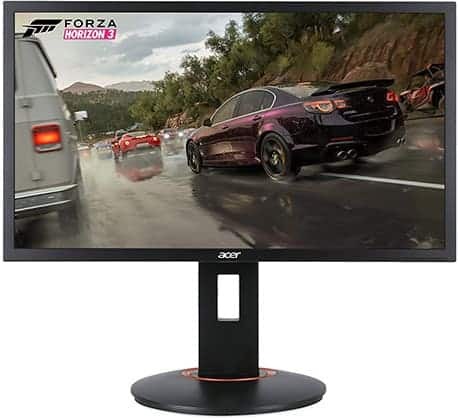 In comparison to the Acer XG270HU, you get a higher contrast ratio (3,000:1) and more vibrant colors (110% sRGB) which along with the curved screen greatly improves the visual aspect of the gaming experience. However, it also has a slower response time which results in noticeable ghosting and trailing in fast-paced games. 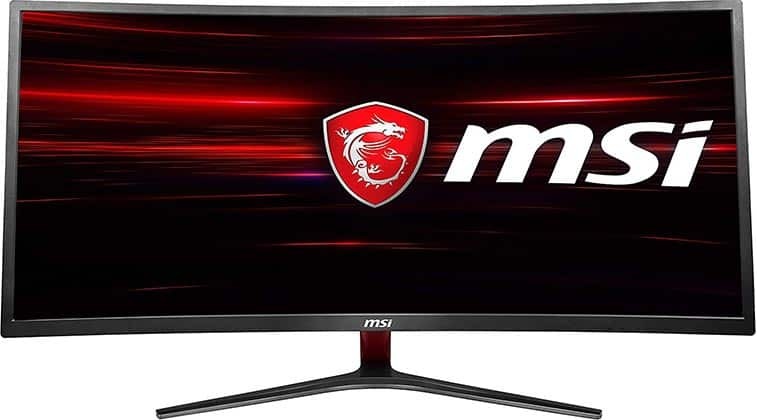 The MSI MAG27CQ curved gaming monitor is equipped with the 1ms (MPRT) motion blur reduction technology which can remove ghosting to an extent, but the 1ms (GtG) response time of TN panels still provides a better pixel transition. All in all, if you aren’t all that into competitive gaming and would rather get better visuals, the MAG27CQ is for you. Besides AMD FreeSync support (48-144Hz range), there are additional gaming features such as custom crosshairs and pre-calibrated picture presets; the variable refresh rate works well with compatible NVIDIA cards too. You can elevate the screen of the monitor up to 65mm, swivel it by +/- 30°, tilt it by -5°/15°, and mount it (75 x 75mm VESA). Connectivity options include HDMI 2.0 (max 120Hz at 1440p), DisplayPort 1.2, DVI, and a headphones jack. MSI Optix MPG27CQ – A newer model of the MAG27CQ. It features a cutting-edge RGB lighting technology, more connectivity options, and a higher peak brightness. It’s a bit more expensive, but if you can afford it – we recommend it. AOC CQ32G1 – The best 32″ 1440p 144Hz curved gaming monitor. LG 32GK650F – The best 32″ 1440p 144Hz gaming monitor with a flat screen. All three alternatives offer stable G-SYNC performance. 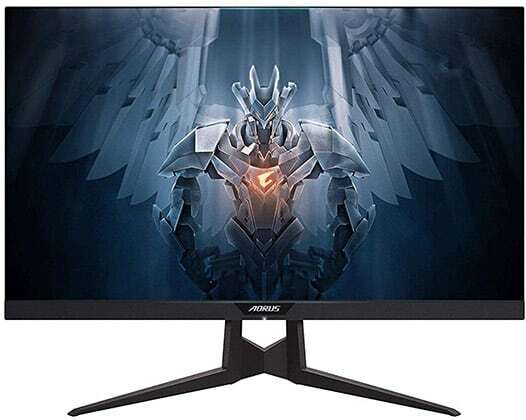 The Gigabyte Aorus AD27QD IPS monitor offers a balance between the TN-panel Acer XG270HU and the VA-panel MAG27CQ. You get a faster response time than that of VA panels and better colors and viewing angles than that of TN panels. The IPS panel of the Aorus AD27QD also ensures precise and consistent colors with 95% DCI-P3 color gamut. Moreover, it supports entry-level HDR with up to 400-nit peak luminance (DisplayHDR 400). It supports AMD FreeSync and works well with G-SYNC cards with a 48-144Hz variable refresh rate range. Note that you can use HDR and FreeSync simultaneously. Alternatively, you can use the 1ms MPRT motion blur reduction technology (branded as Aim Stabilizer). Gigabyte also dubs the Aorus AD27QD as a ‘Tactical’ gaming monitor as it offers additional unique features such as ‘Dashboard’ which allows you to display important system information such as CPU/GPU usage, temperature, frequency, etc. 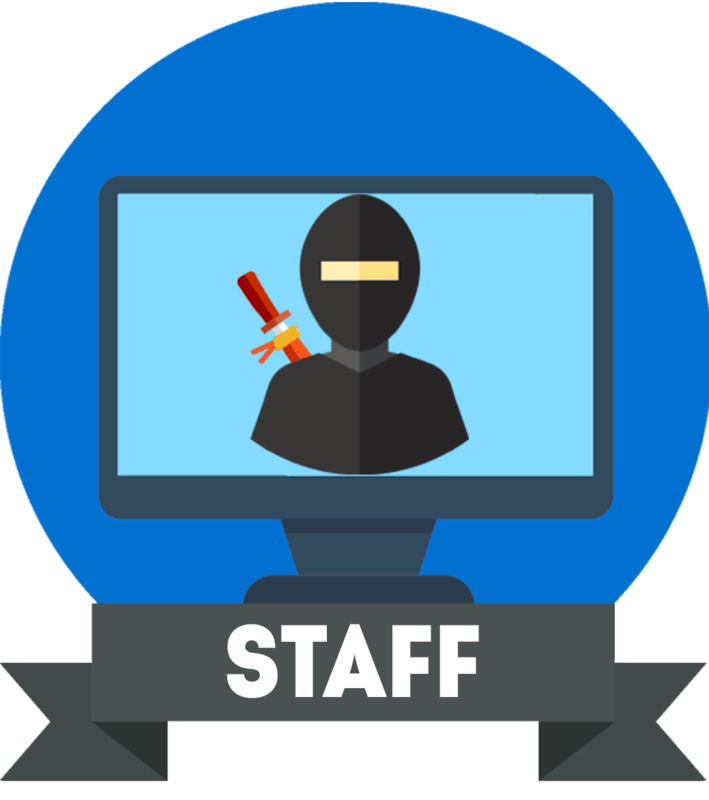 The OSD menu is very user-friendly and packed with features and settings that you can tweak using your keyboard and mouse in the ‘OSD Sidekick’ desktop application. You will also find GameAssisit (custom crosshairs), Picture in Picture and Picture by Picture, Black Equalizer, and RGB Fusion 2 customizable ambient lighting technology. 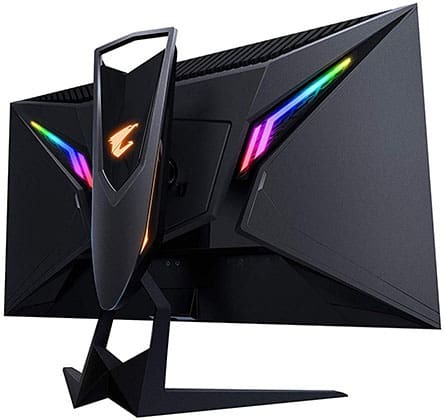 The Aorus AD27QD has a fully ergonomic stand (-5°/21° tilt, -/+ 20° swivel, 90° pivot, 130mm height adjustment, and VESA mount compatibility) as well as extensive connectivity options including two HDMI 2.0 port, DisplayPort 1.2, a headphones jack, a microphone jack, and a dual-USB 3.0 hub. 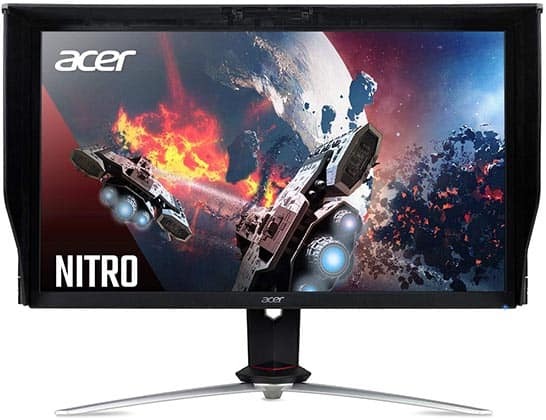 Acer Nitro XV272U – A gaming monitor by Acer based on the same 27″ 1440p 144Hz IPS panel with HDR400, FreeSync, and 1ms MBR. It’s a bit cheaper, but it cannot run FreeSync and HDR at the same time. Nixeus NX-EDG27S v2 – A newer version of the popular Nixeus NX-EDG27. It’s a budget 27″ 1440p 144Hz IPS gaming monitor with a wide 30-144Hz VRR range and G-SYNC compatibility. No HDR nor MBR though. 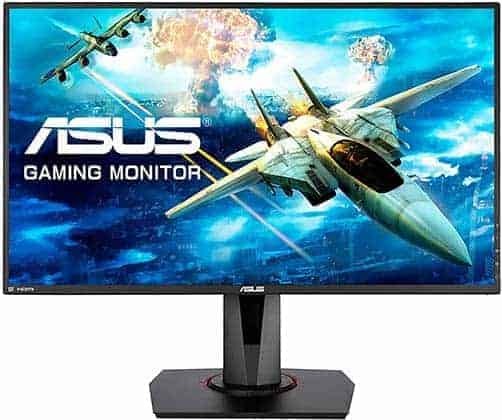 ASUS MG279Q – An older 27″ 1440p 144Hz IPS FreeSync model without HDR and MBR. You will also need to modify its FreeSync range in the driver’s settings and CRU in order to make it compatible with G-SYNC as the VRR range out of the box is only 35-90Hz. Thanks to its G-SYNC module, the ASUS PG279QZ offers a wider dynamic range, lower input lag, and a better response time performance than the Aorus AD27QD, but it lacks HDR support. Furthermore, the ASUS PG279QZ is overclockable up to 165Hz and it features ULMB backlight strobing at 85Hz, 100Hz, or 120Hz. Other features include customizable crosshairs, on-screen timers, and pre-calibrated picture presets. Connectivity options include DisplayPort 1.2, HDMI 1.4 (max 60Hz at 1440p), a headphones jack, a dual-USB 3.0 hub, and dual 2W integrated speakers. The monitor boasts full ergonomic support (height, tilt, swivel, pivot, and VESA mount compatibility). Ultrawide monitors provide you with a wider field of view which can greatly increase the gaming immersion. Make sure your favorite games support the 21:9 aspect ratio format, otherwise, you’ll have to play with black borders or a stretched picture. The LG 29WK600 is an affordable 29″ 2560×1080 ultrawide monitor that’s great for gaming as well as office and general multimedia use. Based on an IPS panel with 99% sRGB color gamut and 2560×1080 resolution, the monitor delivers a crystal-clear picture quality with vivid colors and sharp details thanks to its fairly high 96 pixel-per-inch ratio. It also supports HDR though it’s software-enabled only. So, you won’t get a notably better picture quality for HDR-compatible content, just saturated colors. You will find all the standard LG’s features such as Black Stabilizer, D.A.S, pre-calibrated picture modes, On-Screen Control, Screen Split, and customizable crosshairs. AMD FreeSync is supported as well with a 40-75Hz dynamic refresh rate range over both HDMI and DP. It works with compatible NVIDIA cards as well without any issues. While its stand is tilt-only, the base is detachable allowing you to mount it on a third-party stand via 100 x 100mm VESA mount pattern. At the back of the monitor, you will find two HDMI 2.0 ports, DisplayPort 1.2, a headphones jack, and an audio line-in for the dual 5W MaxxAudio integrated speakers. LG 34WK650 – The 34″ model of this monitor. Keep in mind that it has the same resolution, so you get a lower pixel density. Want an affordable ultrawide monitor with a 144Hz refresh rate? The LG 34UC79G undeniably offers the best value for the price if you want a 144Hz 1080p ultrawide display. The only downside of this gaming display is its low resolution – given the size of its screen. You get the same pixel density you would get on a 27″ 1080p monitor. So, the image is not drastically pixelated. It’s fine for playing games, watching movies, and web-surfing, but for office-related tasks, it isn’t the best. In fact, you can even comfortably do some basic content creation and audio/video editing due to the extra horizontal space the ultrawide resolution offers. Plus, it’s an IPS panel display, so you get vibrant colors, wide viewing angles, and a quick response time speed. Moving on, the LG 34UC79G offers plenty of features including the 1ms Motion Blur Reduction technology that works at 60Hz, 100Hz, 120Hz, and 144Hz. AMD FreeSync is supported with a 50-144Hz variable refresh rate range and it works without issues with NVIDIA cards as well. Other features such as Black Stabilizer, D.A.S, pre-calibrated picture presets, crosshairs, etc are also available. You can elevate the screen of the monitor up to 120mm, tilt it by -5°/20°, or VESA mount it. Connectivity options include DisplayPort 1.2, two HDMI 2.0 ports, a headphones jack, and a dual-USB 3.0 hub. Both G-SYNC and FreeSync work over DisplayPort only. 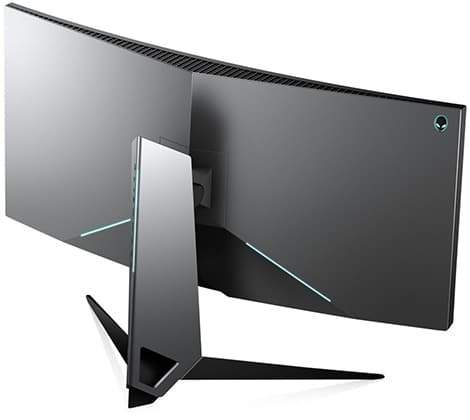 The screen curvature is 3800R which means that it’s subtle but still nicely complements the big ultra-wide screen. 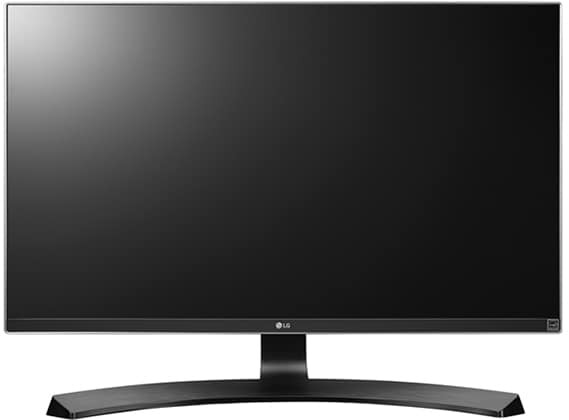 LG 34UC89G – The G-SYNC version of this monitor. It overclocks to 166Hz but has no motion blur reduction technology. It also costs nearly twice as much which is way overpriced considering that you can now get a VRR with compatible NVIDIA cards on the LG 34UC79G model as well. The MSI MAG341CQ is the best ultrawide gaming monitor under $500. There are numerous 3440×1440 100Hz models available ranging up to $1,000. None of them, however, can beat the value for the price the MAG341CQ offers. In fact, the MSI Optix MAG341CQ is actually cheaper than many 3440×1440 60Hz-75Hz ultrawide models. Based on a VA panel with a 3,000:1 contrast ratio, a 250-nit peak brightness, 8-bit color depth with 110% sRGB color gamut, and 3440×1440 resolution, the monitor delivers a crystal-clear picture quality with deep blacks and vibrant colors. You hit the pixel density sweet spot of roughly 110 PPI which results in plenty of screen space available and maximum detail clarity without scaling necessary. The main downside of this monitor, as it’s the case with all VA models, is the response time speed. In fast-paced games, there’s noticeable trailing of fast-moving objects which gets more apparent in darker scenes. This isn’t game-breaking and it’s rather tolerable. Considering the others specs you get for the price, it’s more than a fair trade-off. Gaming features include Picture in Picture and Picture by Picture, pre-calibrated picture presets (FPS, RTS, Movie, etc), customizable crosshair overlays, and FreeSync support (stable G-SYNC performance) with a 48-100Hz dynamic range. Note that there are only two overdrive options (on and off) and two gamma presets (1.8 and 2.2). 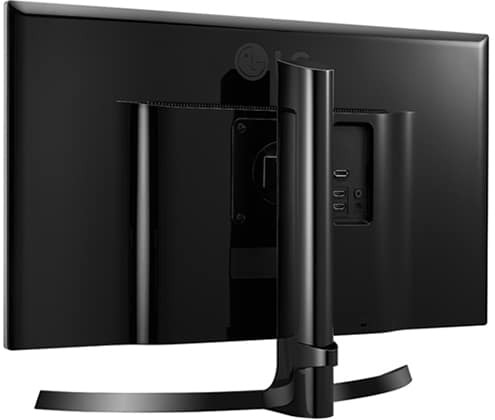 The design of the monitor is tilt-only and not VESA mount compatible, so you will need to purchase a separate adapter if you want to mount the screen on a mounting arm. Connectivity options include DVI (max 60Hz), HDMI 2.0, and DisplayPort 1.2. The steep 1800R screen curvature further increases the gaming immersion. Samsung S34J55W – 34″ 3440×1440 VA FreeSync (75Hz) ultrawide monitor. It’s only $50 cheaper than the MAG341CQ, so we recommend investing in MSI’s model. 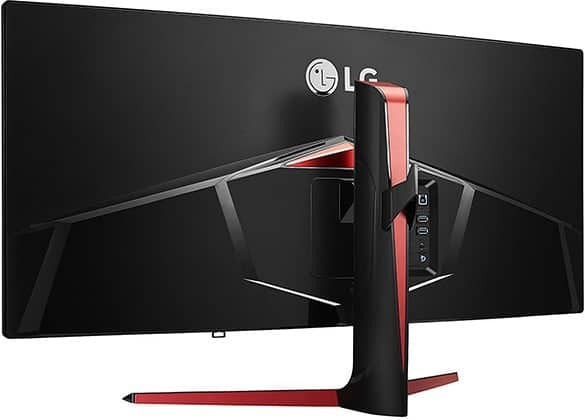 LG 34UC80 – 34″ 3440×1440 IPS FreeSync (75Hz) curved ultrawide monitor. IPS provides more accurate colors and faster response time, but lower contrast ratio. The MAG341CQ also offers smoother motion clarity due to its 100Hz refresh rate. 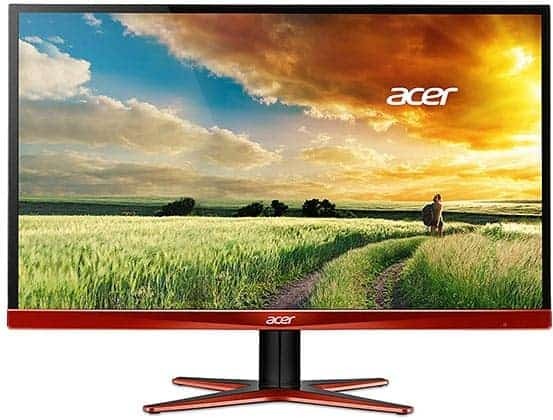 Acer XR382CQK – 38″ 3840×1600 IPS FreeSync (75Hz) curved ultrawide monitor. 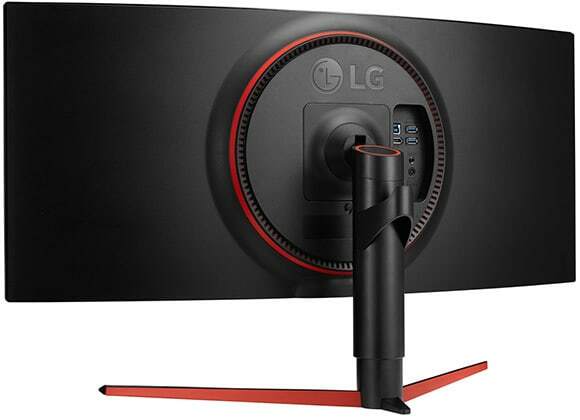 Basically, a larger version of the LG 34UC80 with a higher resolution. If you want to keep the high resolution and refresh rate of the MAG341CQ, but also get the faster response time of IPS panels, the Dell AW3418DW is the most cost-efficient choice. As there are no 34″ 3440×1440 100Hz IPS models with FreeSync, you’ll have to invest in the G-SYNC module of the AW3418DW. Alternatively, we recommend the next display on our list. The Dell Alienware AW3418DW features an IPS panel with 8-bit color depth, a 4ms response time speed, and 3440×1440 screen resolution. So, you get accurate and rich colors, wide viewing angles, and quick response time for minimal ghosting and motion blur. Plus, you can overclock the monitor up to 120Hz for a small but noticeable boost in motion clarity while G-SYNC works all the way from 30Hz to 120Hz. In the OSD menu, you will find the Dark Stabilizer, picture presets (FPS, RTS, and RPG), and Game Enhanced Mode (on-screen timer and an FPS counter) features. The monitor also features the AlienFX RGB lighting technology with four adjustable LED zones. Moving on, the Dell AW3418DW has a rather unique design with a fully adjustable stand (tilt, swivel, height adjustment, VESA mount compatibility). Connectivity options include a quad-USB 3.0 hub, HDMI 1.4, a headphones jack, and a single DisplayPort 1.2 port for 3440×1440 up to 120Hz and G-SYNC. Acer X34 & ASUS PG348Q – Previous-generation 34″ 3440×1440 IPS G-SYNC models. These have a native 60Hz panel that overclocks to 100Hz. They cost roughly the same, but are notorious for their poor quality control concerning IPS glow and backlight bleeding, so we recommend the AW3418DW instead. Acer X34P – Another 34″ 3440×1440 120Hz (overclocked from 100Hz) IPS G-SYNC ultrawide gaming monitor. Choose between it and the AW3418DW according to their current price and availability. Both are equally good, but if you also do photo/video editing, note that the X34P offers 10-bit color support via dithering. The LG 34GK950F is the only 3440×1440 ultrawide monitor with a native 144Hz refresh rate currently available which will provide you with the smoothest ultrawide gaming experience. Based on LG’s latest nano IPS technology, the LG 34GK950F pushes its color gamut to 98% DCI-P3 (135% sRGB) and adds support for entry-level HDR (VESA DisplayHDR 400 standard) with up to 400-nit peak brightness. Now, the monitor will provide you with just a glimpse of what HDR can actually do; even though the display offers a wide color gamut, it still lacks brightness and contrast ratio for an HDR viewing experience worthy of attention. Regardless of its trivial HDR support, the LG 34GK950F still delivers an outstanding picture quality thanks to its accurate, consistent, and vibrant colors as well as the high resolution. While the monitor supports AMD FreeSync 2, VRR also works well with compatible NVIDIA cards. The dynamic range out of the box is 55-144Hz, so make sure to download the 3.0.1 firmware update to extend it to 48-144Hz (if not automatically applied). You also get the 1ms Motion Blur Reduction to further eliminate ghosting, though there isn’t any prominent trailing or motion blur in fast-paced games thanks to the quick response time of the IPS panel. Standard LG features such as Black Stabilizer, D.A.S, crosshairs, and presets are available as well. You can elevate the screen of the monitor up to 110mm, tilt it by -5°/15°, swivel by +/- 20°, or mount it using the VESA pattern. For 3440×1440 at 144Hz, you will need a graphics card with DisplayPort 1.4 as DisplayPort 1.2 limits you to 120Hz at 3440×1440. Connectivity options include DisplayPort 1.4, two HDMI 2.0 ports, a dual-USB 3.0 hub, and a headphones jack. 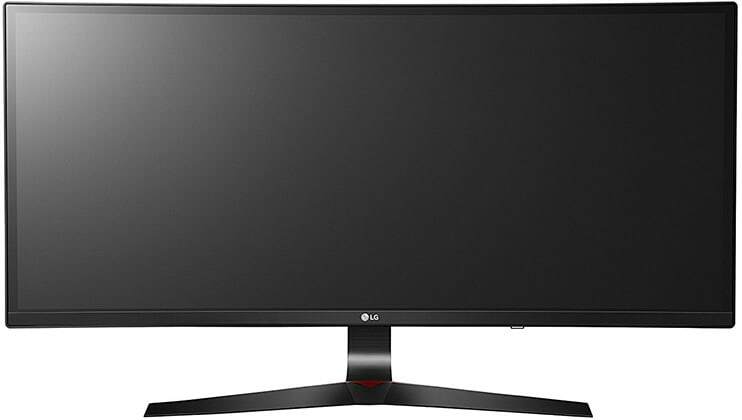 LG 34GK950G – The G-SYNC version of this monitor. It has a 100Hz native refresh rate (120Hz overclock) and no HDR nor motion blur reduction. 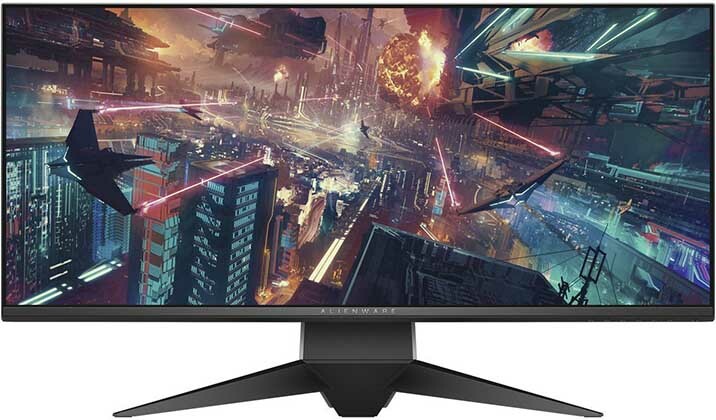 If you want a 34″ 3440×1440 120Hz IPS gaming monitor with G-SYNC, we suggest the previously-mentioned Dell AW3418DW or Acer X34P as they offer better value for the price. Interested in something a bit different and more unique? The Samsung C49HG90 is a 49″ 32:9 3840×1080 ‘super’ ultrawide gaming monitor. 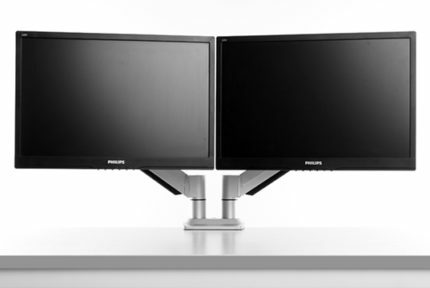 Essentially, you’re getting two 27″ 1080p monitors put side by side, just without the gap in-between. The Samsung CHG90 has a VA panel which boasts a superior contrast ratio of 3,000:1. It also uses the quantum dot technology (QLED) to further increase the color gamut to 125% sRGB. Moreover, it has a peak luminance of 600-nits which in addition to its high contrast and color gamut earned the monitor VESA’s DisplayHDR 600 certification. So, there’s a notable improvement in image quality for HDR content. Moving on, the Samsung C49HG90 features FreeSync 2 and VRR works well with NVIDIA cards as well within the 48-144Hz range over DisplayPort and 50-100Hz over HDMI. Other features include the 1ms MPRT backlight strobing technology, pre-calibrated picture modes (FPS, RTS, and RPG), Black Equalizer, and Arena Lighting RGB. Note that the monitor uses PWM (Pulse Width Modulation) to regulate the brightness, so it’s not flicker-free. If you are sensitive to screen flickering, this may cause you headaches or eye strain. Connectivity options are abundant and include DisplayPort 1.4, mini-DisplayPort 1.4, two HDMI 2.0 ports, a headphones jack, a microphone jack, and a dual-USB 3.0 hub. The stand is fairly versatile with up to 120mm of height adjustment, -2°/12° tilt, +/- 30° swivel, and VESA mount compatibility. Viotek SUW49C – A more budget-friendly version of this monitor without an ergonomic stand, certified HDR support, nor MBR. In this category, you’ll find the best 4K monitors for both PC and console gaming. Keep in mind that in order to run PC games at 4K UHD with decent frame rates and picture settings, you will need a powerful CPU and GPU. Looking for an affordable 4K monitor for console gaming, PC gaming, and other multimedia use? The LG 27UD68P offers excellent value for the price! The IPS panel of the LG 27UD68P ensures stunning colors and details thanks to its 10-bit color depth, over 99% sRGB color gamut, and 4K Ultra HD resolution. Such a high resolution on a 27″ screen results in a pixel density of 163 PPI which makes individual pixels indistinguishable from one another. What’s more, you get plenty of screen space, though for tiny items such as text to be readable, you will need to use scaling. Other panel-related specs include a 300-nit peak brightness, 178-degree viewing angles, and a 5ms response time speed, all of which is standard for a monitor at this price range. The LG 27UD68P supports AMD FreeSync with a 40-60Hz range over HDMI and DisplayPort which makes it a great choice for Xbox One X. While we did manage to get FreeSync to work with an NVIDIA card, many users are reporting that they weren’t able to get it to work on their models. So, it will vary between units, though you should be able to use it at least in the ‘Basic’ mode which limits the VRR range to 48-60Hz. Either way, for a dynamic range this narrow, there’s no LFC support meaning that you’ll need quite a powerful rig to maintain smooth performance at 4K in more demanding games. Other available features include On-Screen Control, Screen Split, four overdrive options, Black Stabilizer, gamma and 6-axis adjustments, and pre-calibrated picture presets. 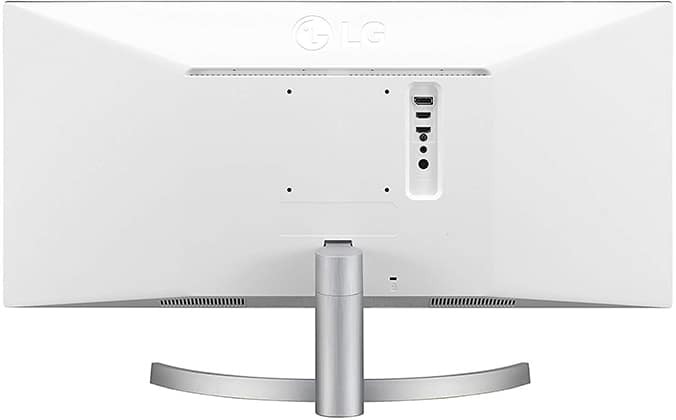 The LG 27UD68P-B monitor has a height adjustable stand (110mm) with tilt (-5°/20°), pivot (90°), and VESA mount compatibility (100x100mm). 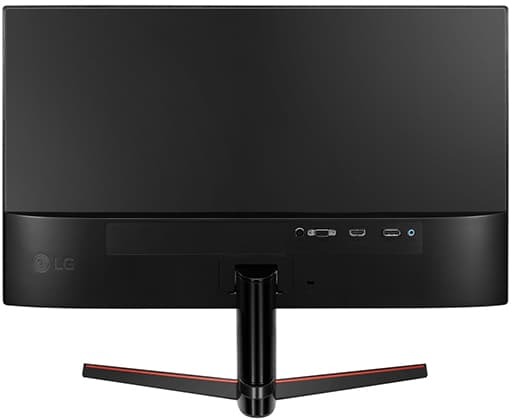 The LG 27UD68-P model (the LG27UD68 without ‘P’) is the same monitor but with a tilt-only design. Connectivity options on both models include two HDMI 2.0 ports, DisplayPort 1.2, and a headphones jack. LG 27UD58 – An older version of this monitor. It has a less versatile design with thicker bezels and doesn’t support FreeSync over HDMI (only over DP). It’s more affordable, however, which makes it a great budget option. FreeSync is unstable with NVIDIA cards on this model. LG 27UK650 – A similar model but with HDR10 support, though it’s only entry-level HDR. FreeSync is unstable with NVIDIA cards on this model as well. ASUS VP28UQG – Cheap 28″ 4K monitor with a TN panel. A great choice for Xbox One X if you’re looking for a cheaper model with a faster response time speed and FreeSync over HDMI support. It has a lower picture quality and viewing angles though. 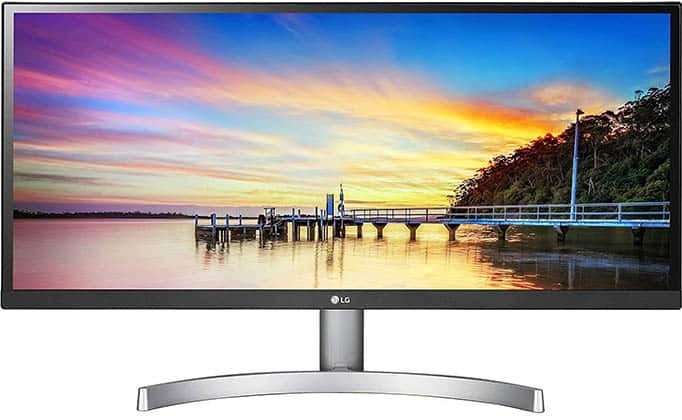 If you want a bigger 4K monitor, the 32″ LG 32UD60 is an affordable VA model with a wide color gamut and high contrast ratio. Thanks to its big screen, the LG 32UD60 will provide you with a more immersive and enjoyable viewing experience, especially when playing console games and watching movies. You still get incredible detail clarity as you would get on a 27″ 4K monitor; in fact, you will still need to scale the picture for everyday PC use. The VA panel of the monitor provides you with a wide 95% DCI-P3 color gamut and a superior 3,000:1 static contrast ratio for more lifelike colors. Note that due to the slower response time as opposed to the LG 27UD68P and its IPS panel alternatives, there will be more ghosting in fast-paced games on the LG 32UD60, but to a tolerable degree. AMD FreeSync is supported over both HDMI and DisplayPort with a 40-60Hz range. For compatible NVIDIA cards, FreeSync seems to work only in the Basic 48-60Hz range. The Black Stabilizer, Screen Split, On-Screen Control, 6-axis, etc features are available as well. 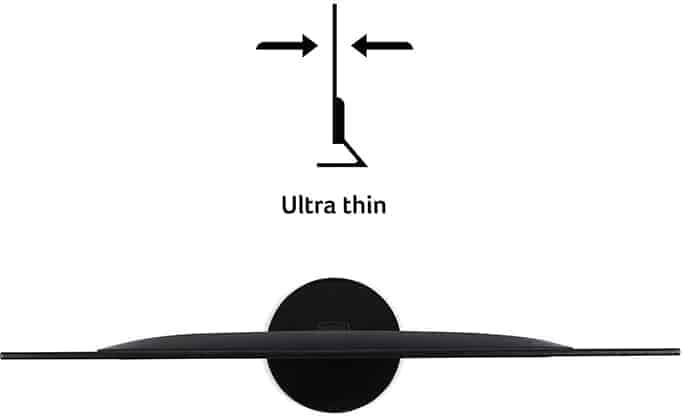 The stand of the LG 32UD60 monitor can be elevated up to 120mm, tilted by -5°/15°, and mounted using the VESA pattern. Connectivity options include two HDMI 2.0 ports, DisplayPort 1.2, a headphones jack, and two 5W integrated speakers. LG 32UD59 – An older model of this monitor without built-in speakers and with a slightly slower response time speed. Samsung U32J590 – A cheaper 32″ 4K VA FreeSync model with a tilt-only design and no wide color gamut nor G-SYNC compatibility at all. 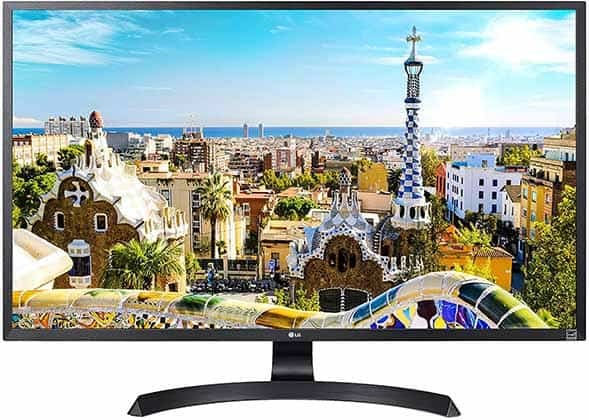 Samsung U32H750 – A more expensive 32″ 4K VA FreeSync monitor with a fully ergonomic design, extensive connectivity options, quantum dots (extended color gamut), and stable G-SYNC performance. Acer XB321HK & Acer XB271HK – 4K IPS models with G-SYNC. For the money, we recommend the next display instead. Philips 436M6VBPAB – A 43″ 4K HDR monitor for console gaming. The Acer XV273K is the best 4K gaming monitor under $1,000. It offers a 120Hz (144Hz overclocked) refresh rate, 1ms MBR, both FreeSync and official NVIDIA G-SYNC compatibility, and entry-level HDR support (VESA DisplayHDR 400). The IPS panel used in the Acer XV273K provides stunning color accuracy at Delta E < 1 with 95% DCI-P3 color gamut (130% sRGB) making it adequate for professional color-critical work. So, if you’re a professional designer who enjoys gaming, this is the perfect monitor for you. In addition to the wider color gamut, HDR content will also get a boost in peak luminance to 400-nits from the standard 350-nits, but the contrast ratio remains at 1,000:1. In other words, you just get a glimpse of HDR as for the ‘real’ HDR viewing experience, a display needs a full-array local dimming (FALD) system in order to be able to produce a much higher brightness and contrast. However, you still get amazing colors and detail clarity for the money as implementing FALD would greatly increase the monitor’s price. FreeSync/G-SYNC is supported with a 48-120Hz dynamic range at 4K UHD with HDR and no color compression. You can also drop the resolution to 1440p or 1080p in which case the dynamic range is extended to 48-144Hz. Now, the Acer XV273K has two DisplayPort 1.4 connectors. In order to get 144Hz at 4K (with no color compression), you will need to connect both DisplayPort connectors to your graphics card. This way, however, you can’t use VRR nor HDR. Other gaming features include VRB (Visual Response Boost) which is a backlight strobing technology (with two modes: Normal and Extreme), Aim Point, three customizable picture prests, and Black Boost. You also get advanced color adjustments such as 6-axis, five gamma presets, and five different color space modes (sRGB, Rec. 709, EBU, DCI, and SMPTE-C). The Acer XV273K features a versatile design with up to 100m height adjustment, -5°/25° tilt, +/- 20° swivel, and VESA mount compatibility. 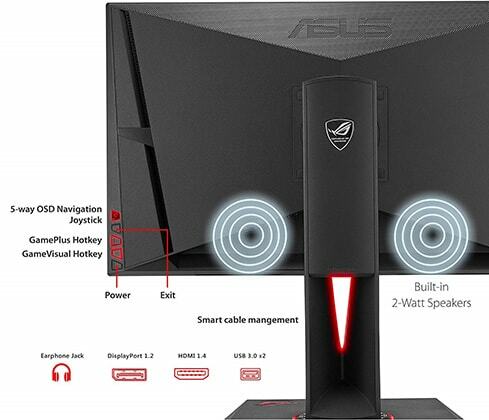 You also get a shielding hood with the monitor for minimal distractions while gaming. Connectivity options include two DisplayPort 1.4 ports, two HDMI 2.0 ports (max 60Hz at 4K HDR), a headphones jack, two integrated 4W speakers, and a quad-USB 3.0 hub. Note that FreeSync isn’t supported over HDMI. 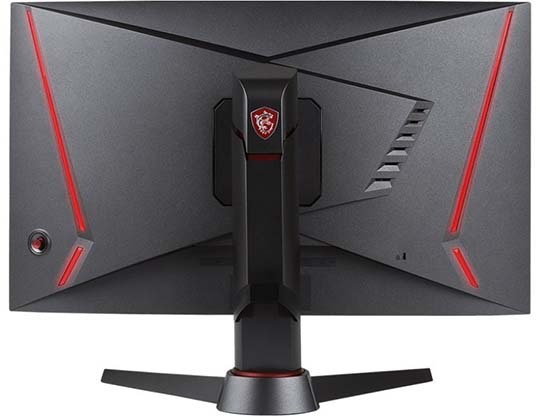 Acer Predator XB273K – G-SYNC version of this monitor. It’s essentially the same monitor but with a G-SYNC module which gets you a slightly lower input lag as well as variable overdrive and a wider dynamic range for an extra $200-$400. The XB273K also has only one DP 1.4 port. So, you can get 144Hz at 4K with G-SYNC but with color compression, whereas the XV273K can offer either 4K 120Hz with FreeSync and no compression – or 4K 144Hz and no color compression but without FreeSync and HDR. If you want the true HDR viewing experience, the ASUS ROG Swift PG27UQ is one the rare gaming monitors that actually has the display capabilities for it. What distinguishes the ASUS PG27UQ from the rest of gaming monitors is its full-array local dimming which consists of 384 individually controlled backlight zones. This allows the monitor to achieve an incredible contrast ratio (50,000:1) and stellar peak brightness (1,000-nits) which in addition to the wide color gamut (97% DCI-P3) and 4K UHD ensures an unprecedented picture quality for HDR content. Moreover, the monitor is factory-calibrated at Delta E ≤ 3. So, it’s not only the best PC gaming monitor, it’s also one of the best monitors for professional use, watching movies, console gaming, and everything in-between. 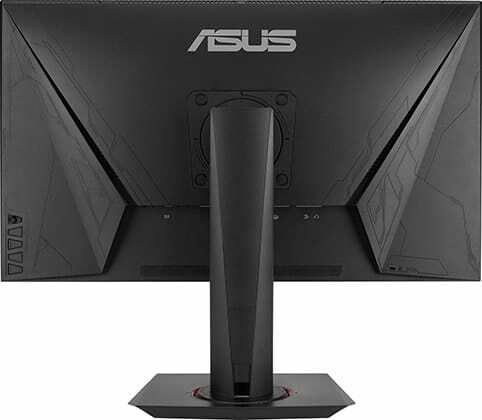 Unlike the previously-mentioned Acer XV273K, the ASUS PG27UQ 4K 144Hz gaming monitor has only one DisplayPort 1.4 connector. So, you are limited to 120Hz at 4K natively. You can overclock the monitor to 144Hz at 4K, but since you are using only one DisplayPort, you will have to sacrifice image quality via 4:2:2 chroma subsampling (8-bit color depth instead of 10-bit). Further, if you want to use HDR, you will have to choose between 120Hz at 4K HDR 8-bit and 98Hz 4k HDR 10-bit. To be fair, this isn’t as bad as it may sound since you wouldn’t be able to reach 144Hz at 4K with high settings in newer games anyway. Plus, most games are using 8-bit color, so you get 4K at 120Hz which is plenty. 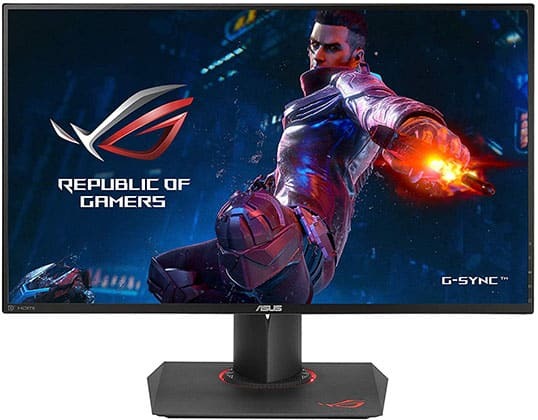 Additionally, the ASUS PG27UQ is equipped with G-SYNC HDR (now called G-SYNC Ultimate) which will ensure smooth performance even at lower frame rates and no input lag penalty for HDR content. 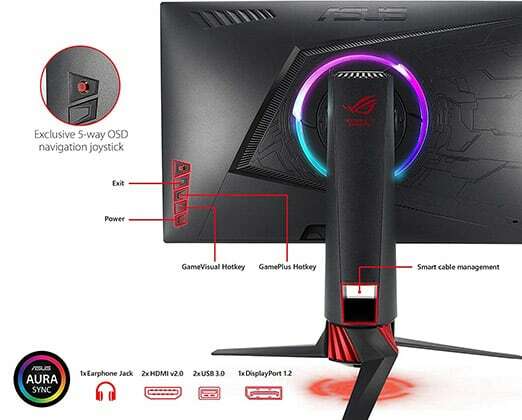 Naturally, you will also find all the standard gaming features such as ASUS GameVisual (pre-calibrated presets) and GamePlus (crosshairs, timers, etc) as well as the AuraSync and ROG logo projector RGB lighting technology. 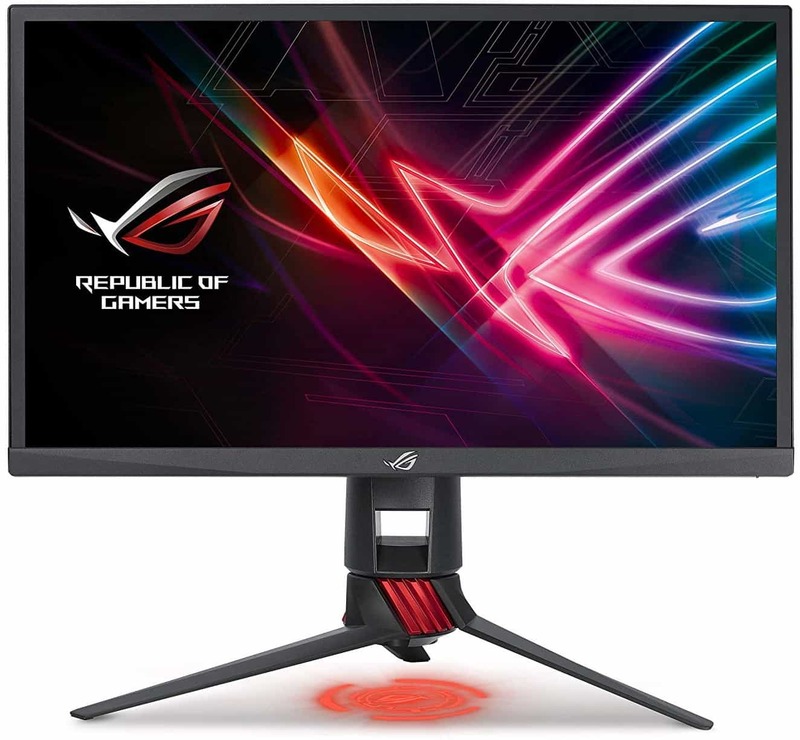 As expected at this price range, the ASUS PG27UQ 4K HDR monitor has a robust and versatile design with up to 120mm height adjustment, -5°/20° tilt, -/+ 35° swivel, 90° pivot, and VESA mount compatibility. Connectivity options include HDMI 2.0, DisplayPort 1.4, a headphones jack, and a dual-USB 3.0 hub. Acer Predator X27 – Essentially the same monitor but by Acer. Pick whichever is cheaper/available at the time of buying or according to your design preference. As you can see, there’s quite a lot of gaming monitors to choose from and deciding which one is the best one for you will depend on your budget, PC system/console, and what type of games you mostly play. Of course, if budget isn’t an issue, you can’t go wrong with the ASUS PG27UQ. However, since HDR still isn’t quite here yet when it comes to PC gaming, the Acer Nitro XV273K offers a lot better value for the money. In case you prefer ultrawide curved displays, the LG 34GK950F will provide you with an incredibly immersive gaming experience. Most people, on the other hand, will find that 27″ 1440p 144Hz IPS monitors offer the ideal screen size/resolution, reasonably high refresh rate, and perfect balance between performance and picture quality. And the Aorus AD27QD and the ASUS PG279QZ are the best such models yet, depending on your personal preference (HDR vs higher refresh rate + G-SYNC).